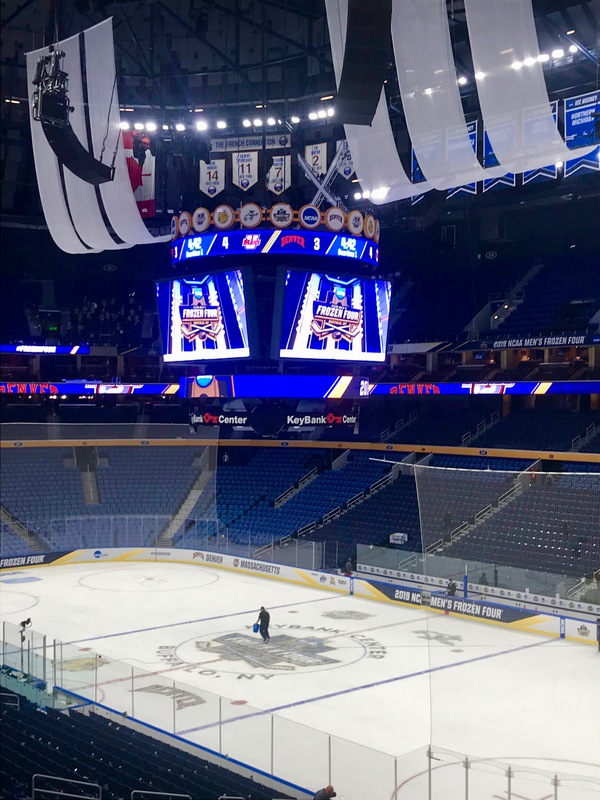 The Frozen Four returned to Buffalo for the first time since 2003, when Minnesota beat New Hampshire for the title. The Frozen Foursome has grown to a Frozen Six, but that has no ring to it, so I’m sticking with Frozen Foursome+. 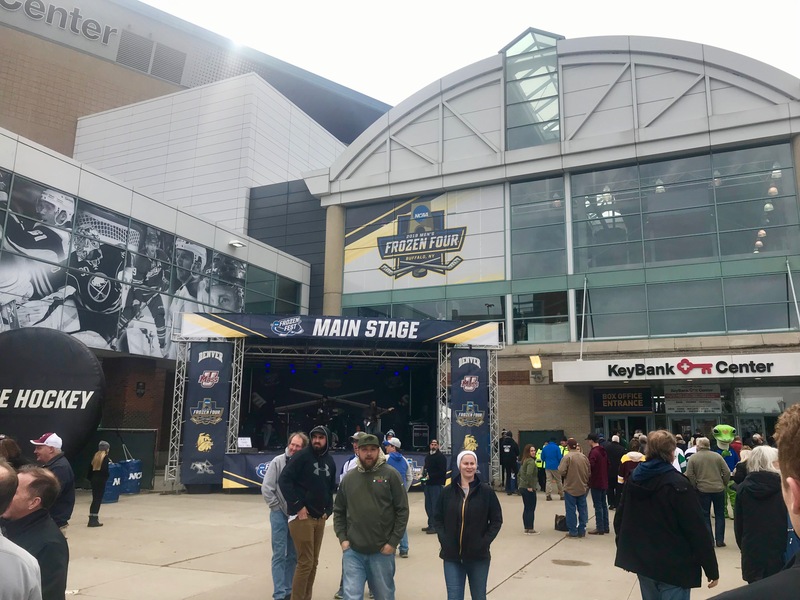 At any rate, we were excited to see the NCAA Championship tournament return to the hockey town in Western New York. 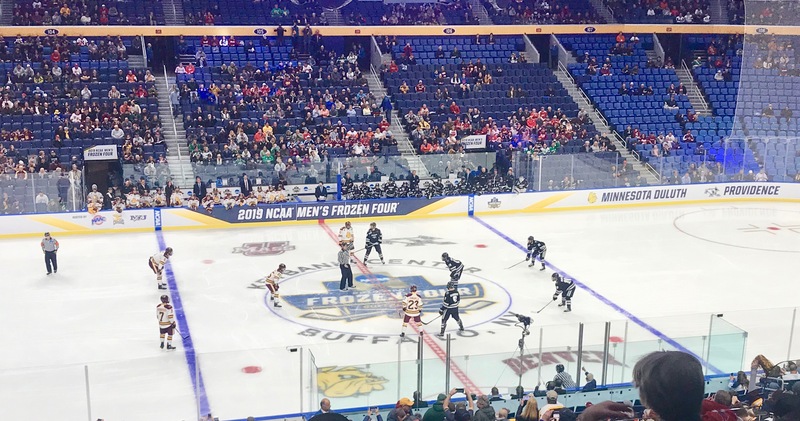 The Duluth Bulldogs had their hands full with the Providence Friars on Thursday afternoon, in the first game. The game was scoreless after one period of play. Then Duluth’s Justin Richards put the Bulldogs in the lead in period two. But Josh Wilkins of the Friars quickly tied things up. Billy Exell of the Bulldogs would get the game winning goal at the halfway mark of the final period. Duluth would add two empty net goals, for a 4-1 win. 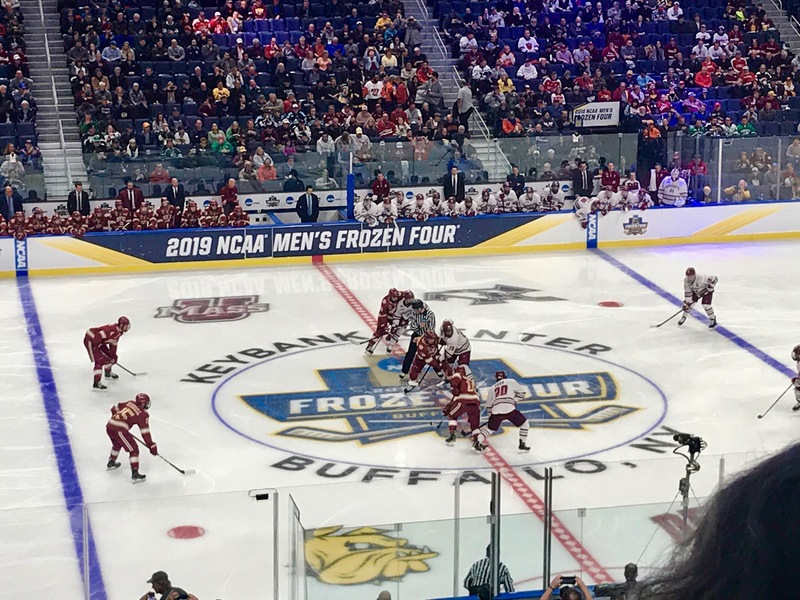 It will be the third year in a row that Minnesota-Duluth will appear in the title game. In the late semi-final game, Denver University played the University of Massachusetts. 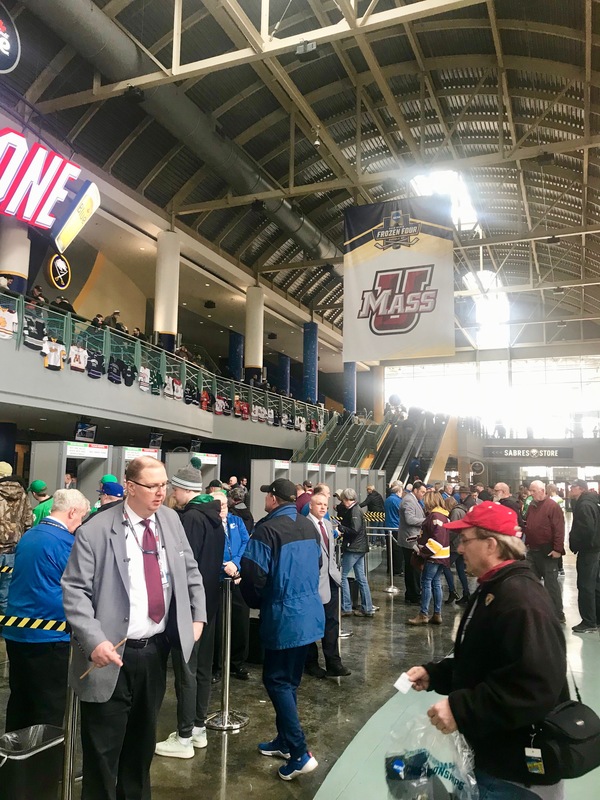 It was the first ever visit for UMass to the Frozen Four, and Denver’s 17th appearance. This would prove to be an interesting matchup, with a lot of emotional swings. Denver took the lead on a power play goal by Colin Staub, at the end of a 5 minute major penalty on UMass. Denver then took their own 5 minute major, right after a minor penalty, giving UMass a 5 on 3 advantage. The Minutemen would go on to score three goals before the major penalty was over. The third goal was just a beautiful shot by John Leonard. UMass would go into the first intermission up 3-1. After the rush of the first period, there was no scoring at all in period two. It wasn’t until the halfway mark of the third frame, when the Pioneers’ Cole Guttman put the puck past the UMass goalie Filip Lindberg. Suddenly the momentum was with DU. Guttman again came up big with the tying goal, with just under 4 minutes to play. We were on to overtime. The Frozen Foursome+ compared notes, and placed their bets. The play in OT was back & forth. Both teams had chances to walk away with a win. Momentum came and went. The pace picked up. Tensions rose. The Curator’s stomach was in knots. Then at the 15:18 mark, Marc Del Gaizo, rifled a shot on net, and the puck flew past DU’s Filip Larsson. UMass had a 4-3 OT victory over Denver, and would move on to face Duluth in the title game. UMass has some sharp-shooters on that team. They are fast, and play some great hockey as a unit. UMD will be facing a tough challenge, but UMD has been here before. Should be a phenomenal final. I can’t wait for puck drop. Final score 4-3 UMass. An empty arena, but the UMass band is still up in the rafters playing. 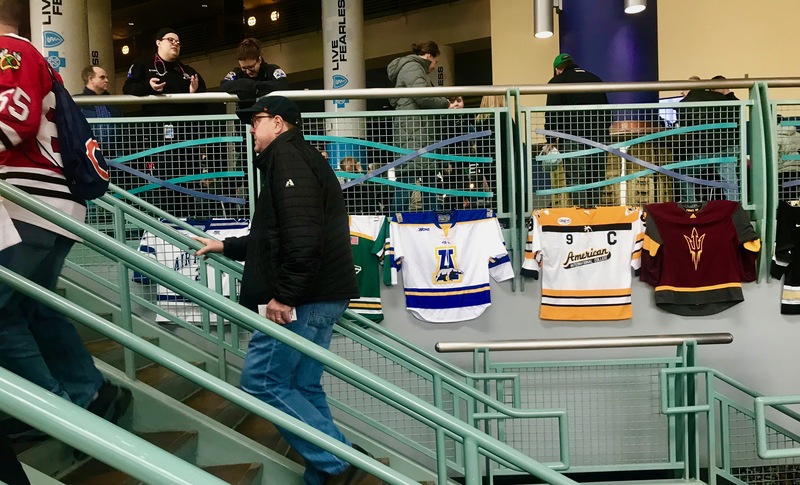 This entry was posted on Saturday, April 13th, 2019 at 6:06 AM	and tagged with buffalo, denver, Fairbanks, history, hockey, Minnesota, new york, photo, providence, travel, UMass, umd and posted in sports. You can follow any responses to this entry through the RSS 2.0 feed.